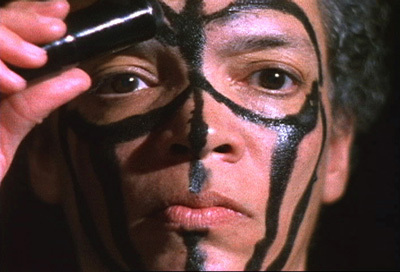 Maren Hassinger, daily mask, 2004, still from a color video with sound, 3 minutes 32 seconds. Two seminal early works, Howardena Pindell’s Free, White and 21, 1980, and Adrian Piper’s Cornered, 1988, reveal the earliest uses of video in art, in which it frequently helped disseminate performance-based work. Addressing the camera directly, both artists recall personal racial affronts and challenge viewers to consider their own actions. Perhaps more subtle but no less jarring are more recent videos by Maren Hassinger, Bearni Searle, and the interracial couple Bradley McCallum and Jacqueline Tarry, in which the artists use their own bodies as symbolic metaphors for personal experience. Animated silhouettes by Kara Walker, a five-channel video installation by newcomer Jessica Ann Peavy, and a new piece by Carrie Mae Weems take a more cinematic approach, weaving narratives that challenge historical perceptions, especially as they are perpetuated by the media. And Lauren Woods provides a stunning three-channel video projection that looks right past the objects of racial stigmatism to the viewers complicit in creating that sense of “otherness.” Like the best surveys, this exhibition illuminates many connections between the works without forcing them into a curatorial straitjacket.